When you have found the one and your parents are excited you’ve finalised your wedding date. What do you do next? Book the venue! Weddings are truly amazing but wedding planning is not. We are here to ease your wedding planning a bit and have brought a list of venues that caters to all your needs and requirements. With years of experience in the hospitality sector, these venues have exquisite decor preparations appropriate for each of your wedding ceremonies. You can stay rest assured of the quality of service provided from their end and pick any one from the list for your big day. A perfect blend of ultimate sophistication and elegance, these wedding venues in Western Suburbs are made for beautiful weddings. Anmol Banquets, Goregaon West, Mumbai is an ideal venue to plan your wedding ceremony and reception party. It is located at a close distance from Inorbit Mall and Goregaon Station which makes it convenient for all. Treat your guests with a royal feast of multi-cuisine delicacies to choose from in both vegetarian and non-vegetarian food. Situated in Goregaon, Anmol Banquet hall Goregaon is an elegant yet economical option for many. The additional advantage of this venue is that it takes care of each and every aspect of an event to the very last detail. Whether you want delicious food, out of the world décor or entertainment options, Anmol Party Hall will arrange everything for you with ease! With different banquet spaces, One Up Banquets, malad West is just perfect to host pre-wedding and wedding functions, like mehndi and sangeet or a reception party. It allows a combination of some party areas offering a wider space for bigger celebrations. The venue has their internal wedding specialist team who look after all your wedding related services, right from decorating the venue to match the fanfare of your wedding festivities, serving delicious multi-cuisines to foot-tapping music and entertainment facilities. Alcohol too is served in-house, making it suitable for fun cocktail parties. The venue offers complimentary changing rooms for the bride and the groom on their special day. The elegant décor of the venue makes it an ideal option for a grand wedding. Thakur Banquet (Thakur Village Hall), Kandivali East, Mumbai has banquet halls which can accommodate a huge crowd for your wedding and reception. It is at a prime location and its warm, experienced staff is its greatest selling point. It has large, reasonably priced, Air-Conditioned halls with bright and elegant décor that goes a long way in making this a popular wedding venue, as well as an apt location for parties. The venue serves a wide range of vegetarian delicacies to their guests, making it an ideal choice for Jains and Gujratis. It is easily accessible through Thakur Road and Western Express Highway and is a great venue to plan your upcoming events and make them a grand success. Whether you are planning to have a kickass sangeet, mehendi, wedding reception or any other social event in the western suburbs, then we have just the place for you. 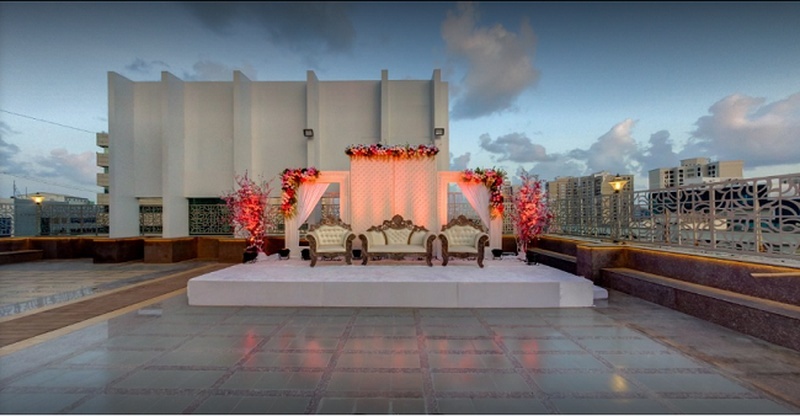 Flag's Avant Garde, Andheri West is one versatile venue that you can bank on for all your wedding needs. From a lawn to a lavish banquet hall - they have it all! Flags Avant Garde, Andheri West, Mumbai has various spaces that are ideal for social events, pre-wedding functions and transforms into a charming wedding venue with the decorator's touch. The pillar less banquet halls provide an unobstructed view of the ceremonies in progress. If you're looking for a wedding venue in Andheri Mumbai city, we have the perfect one to fulfill all your needs and requirements. An ideal wedding and social event venue in the city, the visitors at Hotel Kohinoor Continental, Andheri are greeted with the best of hospitality. You are sure to get pampered with the amenities and luxurious accomodation that adds charm to the property. The contemporary decor, warmth of reception, spacious lobby and cozy interiors create a 'home away from home' ambience. The perfect banquet hall in Andheri for hosting all kinds of wedding functions and more, this four-star hotel caters to the requirements of everyone. An experience at Kohinoor Continental will certainly leave you with fond memories to accompany you back home.